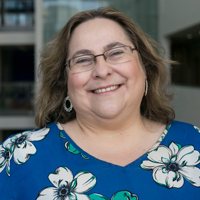 Victoria is an Associate Dean for Taught Postgraduate Studies and Internationalisation who specialises in Developmental Speech Language and Communication Needs in Children and Young People. She joined City University in 2001 and previously worked at the University of Reading and The University of Witwatersrand, South Africa. Victoria Joffe is Associate Dean for taught postgraduate studies and internationalisation in the School of Health Sciences, and Professor in the Enhancement of Child and Adolescent Language and Learning in the Division of Language and Communication Science at City University London. Victoria's area of clinical and research expertise include specific language impairment, child speech disorder, the interface between education and speech and language therapy, collaborative practice and the training of teaching staff, the relationship between language, metalinguistic awareness and literacy, language and communication intervention in secondary school students and evidence-based practice for children and young people with special educational needs. She has recently completed a Nuffield funded intervention research project (ELCISS) on enhancing language and communication in secondary school students with language and communication impairments through narrative and vocabulary enrichment (www.elciss.com). Victoria has subsequently obtained grants from The Communication Trust and local educational authorities to continue her work in training school staff to meet the needs of children with speech, language and communication difficulties. Victoria is a trustee and governor of the Link school, a school for students with special educational needs and is also a trustee of I CAN, the largest children's communication charity in the UK. She is an Associate editor of the journal, Language, Speech and Hearing Services in Schools. She also acts as a speech and language therapy partner for the Health Care and Professions Council. She is external examiner at the School of Psychological Sciences, The University of Manchester. Victoria is a trustee and councillor for research and development at the Royal College of Speech and Language Therapists (RCSLT) and is chair of the RCSLT's national clinical excellence network/special interest group for older children and young adults with speech, language and communication needs. Victoria also serves as an expert reviewer for the National Institute for Health Research (NIHR) Clinical Academic Training Scheme. - Associate Dean for Internationalisation. Specialist Speech and Language Therapist working in Schools with Older Children and Young People with Speech, language and Communication Needs. Training education staff in enhancing language and communication in schools Specialist Speech and Language Therapist working with children with speech sound disorders. Enhancing language and Communication in Schools: Victoria's research has focused on the ELCISS (Enhancing Language and Communication in Secondary Schools) programme - exploring the language and communication in secondary school students with speech, language and communication needs. This research is innovative and ground breaking in that it is the first of its kind to explore the effectiveness of vocabulary and narrative interventions, delivered by school teaching assistants, with adolescents with Speech, Language and Communication Difficulties (SLCD. The original study was funded by The Nuffield Foundation, and was a randomised control research study exploring the effectiveness of two interventions (narrative and vocabulary enrichment) in enhancing the language and communication of 357 adolescents with SLCD. The research also investigated the cognitive, language, communication abilities and social, emotional and behavioural functioning of secondary school students with poor educational attainment. See www.elciss.com for further details. Both intervention programmes have been published and are available through Speechmark Publications - http://www.speechmark.net/shop/narrative-intervention-programme and http://www.speechmark.net/shop/vocabulary-enrichment-programme. Follow up studies exploring the impact and generalisation of the ELCISS interventions on literacy and on behaviour in school is being undertaken and funded by the Redbridge and Barking and Dagenham Local Authorities. Further training of teaching assistants, teachers and schools is being funded by The Communication Trust. Targeting Adolescent Mental Health in Schools - TAMHS Project: Victoria is also involved in a research project funded by the Department for Education and conducted in collaboration with Barking and Dagenham Local Authority and the Barking and Dagenham CAMHS service (Child and Adolescent Mental Health Service). This study aims to explore the relationships between mental health, well-being and language and communication of secondary school students (aged between 10-13 years) with SLCD. Profiling Outcomes Across Time' (POAT) tool: Victoria is also currently working with Nabiah Sohail, from Hackney Learning Trust, on the development of a new and innovative measure of functional outcomes for children and adults with speech, language, communication difficulties (SLCD) - Profiling Outcomes Across Time' (POAT) tool. It was initially commissioned by the government in response to the Bercow review looking at the needs of children with SLCD. The POAT is a series of rating scales to chart change over time and is appropriate for people across the lifespan. It consists of ten subscales: eating and drinking, pre-verbal communication, speech, voice, fluency, talking and listening, communication, behaviour, social skills and emotional well-being. The tool is currently been piloted across a range of services and data is being collected for approximately 350 individuals. The tool will be published in 2014 by Speechmark Publications. Other research projects in which Victoria is involved include exploring the current practice of Speech and Language Therapy in the UK, the current practice of paediatric Speech and Language Therapists in managing children with speech sound disorders, and the involvement of Speech and Language Therapists in Evidence-based Practice. Victoria is also involved in developing a new Social and Life Skills programme to enhance the language, communication and quality of life in older children and young people who have been excluded from Schools, are in Pupil Referral Units or young offender institutions. This work is being undertaken in collaboration with Foundation 4 Life and AOPM (The Association of Panel members for Communities for Youth Justice). - Redbridge Local Authority Grant: Enhancing Language and Communication in Secondary Schools. - The Nuffield Foundation Grant: Enhancing language and communication in secondary school children with specific language impairment through two intervention programmes: narrative and vocabulary enrichment. (2013). Favourite Idioms. ISBN 978-0-86388-965-3. (2013). More Favourite Idioms. ISBN 978-0-86388-983-7. Joffe, V. (2011). Narrative Intervention Programme. ISBN 978-0-86388-797-0. Joffe, V.L. (2011). Vocabulary Enrichment Intervention Programme. UK: Speechmark. ISBN 978-0-86388-798-7. Joffe, V., Cruice, M. and Chiat, S. (2008). Language disorders in children and adults. Joffe, V., Cruice, M. and Chiat, S. (Eds. ), Wiley. ISBN 978-0-470-51839-7. Joffe, V, , Cruice, M. and Chiat, S. (Eds. ), (2008). Language disorders in children and adults. Wiley. ISBN 978-0-470-51839-7. Joffe, V., Cruice, M. and Chiat, S. (2008). Language Disorders in Children and Adults. Wiley. ISBN 978-0-470-98790-2. Joffe, V.L. (2015). Common practice in speech sound disorders in UK. Children's Speech Sound Disorders (pp. 244–246). Oxford, UK: John Wiley & Sons. ISBN 978-1-118-63401-1. Joffe, V.L. (2013). Using narratives to enhance language and communication in secondary school students. Using Storytelling to Support Children and Adults with Special Needs Transforming Lives Through Telling Tales Routledge. ISBN 978-0-415-68775-1. Joffe, V.L. (2009). A survey of clinical practice in the UK. In Bowen, C. (Ed. ), Children's Speech Sound Disorders Wiley. ISBN 978-0-470-72364-7. Joffe, V.L. (2008). Minding the gap in research and practice in developmental language disorders. In Joffe, V., Cruice, M. and Chiat, S. (Eds. ), Language disorders in children and adults Wiley. ISBN 978-0-470-51839-7. Joffe, V.L. (2008). Introduction: Language disorders in children and adults: current themes, issues and connections. In Joffe, V., Cruice, M. and Chiat, S. (Eds. ), Language disorders in children and adults Wiley. ISBN 978-0-470-51839-7. Joffe, V.L. (2006). Enhancing language and communication in language-impaired secondary school-aged children. Language and Social Disadvantage Theory into Practice John Wiley & Sons. ISBN 978-0-470-02911-4. Varlokosta, S. and Joffe, V. (2007). Lexical and grammatical abilities in Williams Syndrome: Evidence from past tense and plural inflection. Joffe, V. and Varlokosta, S. (2006). Syntactic abilities in Williams syndrome: how intact is 'intact2? Joffe, V.L., Rixon, L. and Hulme, C. (2019). Improving storytelling and vocabulary in secondary school students with language disorder: a randomized controlled trial. International Journal of Language and Communication Disorders. doi:10.1111/1460-6984.12471 . Pagnamenta, E. and Joffe, V.L. (2018). Preregistration research training of speech and language therapists in the United Kingdom: A nationwide audit of quantity, content and delivery. International Journal of Evidence-Based Healthcare, 16(4), pp. 204–213. doi:10.1097/XEB.0000000000000143 . Lowe, H. and Joffe, V. (2017). Exploring the feasibility of a classroom-based vocabulary intervention for mainstream secondary school students with language disorder. Support for Learning, 32(2), pp. 110–128. doi:10.1111/1467-9604.12157 . Clegg, J. and Joffe, V. (2017). Working Memory in Children with Speech, Language and Communication Needs. Child Language Teaching and Therapy, 33(1), pp. 3–4. doi:10.1177/0265659017693143 . Joffe, V. (2015). An International Perspective: Supporting Adolescents with Speech, Language, and Communication Needs in the United Kingdom. SEMINARS IN SPEECH AND LANGUAGE, 36(1), pp. 74–85. doi:10.1055/s-0034-1396448 . Lousada, M., Jesus, L.M.T., Hall, A. and Joffe, V. (2014). Intelligibility as a clinical outcome measure following intervention with children with phonologically based speech-sound disorders. International Journal of Language and Communication Disorders, 49(5), pp. 584–601. doi:10.1111/1460-6984.12095 . Lousada, M., Jesus, L.M., Capelas, S., Margaça, C., Simões, D., Valente, A. … Joffe, V.L. (2013). Phonological and articulation treatment approaches in Portuguese children with speech and language impairments: a randomized controlled intervention study. Int J Lang Commun Disord, 48(2), pp. 172–187. doi:10.1111/j.1460-6984.2012.00191.x . Pring, T., Flood, E., Dodd, B. and Joffe, V. (2012). The working practices and clinical experiences of paediatric speech and language therapists: a national UK survey. Int J Lang Commun Disord, 47(6), pp. 696–708. doi:10.1111/j.1460-6984.2012.00177.x . Joffe, V.L. and Nippold, M.A. (2012). Progress in understanding adolescent language disorders. Lang Speech Hear Serv Sch, 43(4), pp. 438–444. doi:10.1044/0161-1461(2012/12-0052) . Joffe, V.L. and Black, E. (2012). Social, emotional, and behavioral functioning of secondary school students with low academic and language performance: perspectives from students, teachers, and parents. Lang Speech Hear Serv Sch, 43(4), pp. 461–473. doi:10.1044/0161-1461(2012/11-0088) . Joffe, V. and Pring, T. (2009). Response to a letter from Dr Liz Dean. International Journal of Language and Communication Disorders, 44(5), pp. 810–811. doi:10.1080/13682820802559517 . Joffe, V.L. (2009). Explicit print referencing enhances early literacy in preschoolers. Evidence-Based Communication Assessment and Intervention, 3(3), pp. 145–150. doi:10.1080/17489530903198307 . Joffe, V. and Pring, T. (2009). Children with phonological problems: A survey of clinical practice. INTERNATIONAL JOURNAL OF LANGUAGE & COMMUNICATION DISORDERS, 44(5), pp. 810–811. doi:10.1080/13682820802559517 . Joffe, V. (2008). Some (but still insufficient) evidence exists for language interventions for school-age children with developmental speech and language impairments. Evidence-Based Communication Assessment and Intervention, 2(2), pp. 76–80. doi:10.1080/17489530802252775 . Joffe, V. and Pring, T. (2008). Children with phonological problems: a survey of clinical practice. Int J Lang Commun Disord, 43(2), pp. 154–164. doi:10.1080/13682820701660259 . Varlokosta, S., Thomaidis, L., Archonti, A., Tsiamaki, D., Fryssira, H. and Joffe, V. (2008). Linguistic development of children with Williams Syndrome: A control study. PEDIATRICS, 121. doi:10.1542/peds.2007-2022GG . Joffe, V.L., Cain, K. and Marić, N. (2007). Comprehension problems in children with specific language impairment: does mental imagery training help? Int J Lang Commun Disord, 42(6), pp. 648–664. doi:10.1080/13682820601084402 . Joffe, V. and Varlokosta, S. (2007). Patterns of syntactic development in children with Williams syndrome and Down's syndrome: evidence from passives and wh-questions. Clin Linguist Phon, 21(9), pp. 705–727. doi:10.1080/02699200701541375 . Joffe, V. and Varlokosta, S. (2007). Language abilities in Williams syndrome: Exploring comprehension, production and repetition skills. Advances in Speech Language Pathology, 9(3), pp. 213–225. doi:10.1080/14417040701261517 . Hasson, N. and Joffe, V. (2007). The Case for Dynamic Assessment in Speech and LAnguage Therapy. Child Language Teaching and Therapy, 23(1), pp. 9–25. doi:10.1177/0265659007072142 . Joffe, V.L. (2001). Children's language and communication difficulties. Understanding, identification and intervention. INTERNATIONAL JOURNAL OF LANGUAGE & COMMUNICATION DISORDERS, 36(1), pp. 146–147. Joffe, V. and Poulton, H. (2001). The joint delivery of personal and social education (PSE) in a special school. Int J Lang Commun Disord, 36 Suppl, pp. 228–233. Joffe, V. (2000). Uncommon understanding. Development and disorders of language comprehension in children. BRITISH JOURNAL OF DEVELOPMENTAL PSYCHOLOGY, 18, pp. 476–477. Joffe, V.L. (1998). Rhyming and related skills in children with specific language impairment. Cahiers de Psychologie Cognitive, 17(2), pp. 479–512. Joffe, V.L. (1997). Trouble talking. A guide for the parents of children with speech and language difficulties - Law,J, Elias,J. BRITISH JOURNAL OF DEVELOPMENTAL PSYCHOLOGY, 15, pp. 246–247. Penn, C., Jones, D. and Joffe, V. (1997). Hierarchical discourse therapy: A method for the mild patient. Aphasiology, 11(6), pp. 601–632. Joffe, V. and Shapiro, G. (1991). Sound-based language play in four language-impaired subjects. S Afr J Commun Disord, 38, pp. 119–128. Supporting vocabulary learning in children with SLCN. Principles and strategies for Teaching and Speech and Language Therapy Staff. Birmingham (2013). Description: Primary Care and Public Health Conference, invited speaker. Enhancing Language and Communication for Children and Adolescents with Language and Communication Difficulties: Storytelling and Vocabulary Enrichment. (2013). Description: Association for Speech and Language therapists in Independent Practice - Annual Conference, invited speaker. Narrative Approaches in Speech and Language Therapy. Birmingham (2012). Description: Primary Care 2012 Conference, invited speaker. Turning routine clinical work into evidence-based practice. Manchester (2012). Description: RCSLT Conference. Driving transformation using evidence based practice, invited speaker. Readiness to practice: narrowing the gap between student and clinician. Manchester (2012). Description: RCSLT Conference. Driving transformation using evidence based practice. Vocabulary learning in mainstream secondary school students with speech, language and communication needs. Manchester (2012). Description: RCSLT Conference. Driving transformation using evidence based practice. Poster Presentation. Enhancing narrative development in adolescents withlanguage impairments: A randomized control trial. Sorbonne University, Paris (2012). Description: Narrative, Intervention and Literacy Conference, Poster Presentation. Oral narrative abilities of adolescents with poor literacy skills. Sorbonne University, Paris (2012). Profiling and Enhancing the language and communication skills of secondary school students with language and communication difficulties. Portugal (2012). Description: University of Alveiro, Institute of Electronics and Telematics Engineering of Aveiro (IEETA), invited speaker. Going to secondary school with a language impairment: What are the difficulties and can they be reduced? Profiling and enhancing language and communication in secondary school students with SLCN. Harrogate (2011). Enhancing language and communication in secondary school through two intervention programmes: narrative and vocabulary enrichment. (2011). Description: Afasic Cymru conference - Communication Counts, invited speaker. Description: RCSLT conference: Communication across the boundaries - Evidencing collaborative practice in schools: Together towards improvement. Invited speaker. Talking heads: Speech and Language Therapy in the Current Context - Challenges and Opportunities. (2013). Ireland Association for Speech and Language Therapists Annual Conference, Keynote speaker. Enhancing Language and Communication for Children and Adolescents through Storytelling and Vocabulary Enrichment. University of Oslo (2013). Norwegian Logopeadics conference - Norsk Logopedlags vinterkurs, Keynote speaker. Facilitating training and enhancing knowledge, skills and awareness of speech, language and communication within the current economic climate. (2011). Speechmark Speech and Language Conference. Keynote address. SLCN in older children and young adults: lessons learned and ways forward. City University, London (2011). Lost for Words: Lost for Life Conference. Keynote address. Profiling and enhancing the language abilities of secondary school students with language and communication difficulties. Neutrich, Switzerland (2010). 11th colloque de logopédie. Langage et identité à l'adolescence. Keynote address.